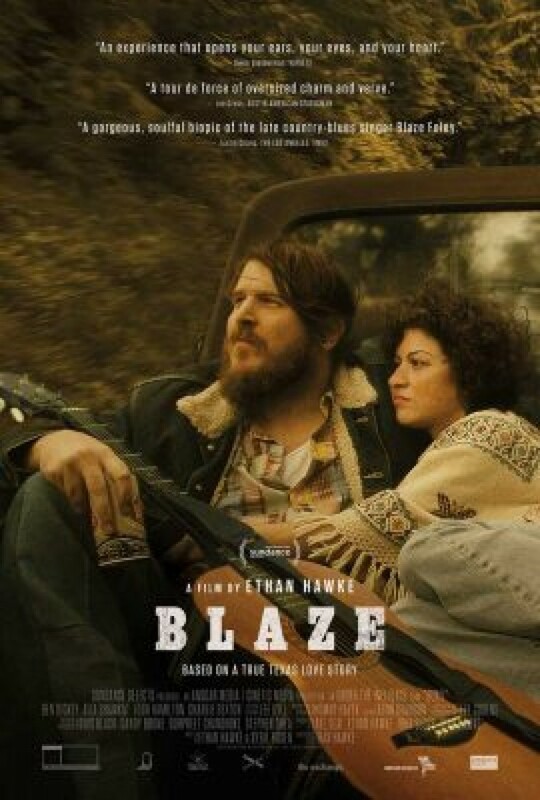 Ben Dickey as Blaze Foley, and Alia Shawkat as Sybil Rosen in Ethan Hawke’s BLAZE. Courtesy of IFC Films. An IFC Films release. You have to respect the way Ethan Hawke approached his latest film Blaze and its central character Blaze Foley. He’d never heard the artist’s name or music until being stopped in his tracks upon listening to John Prine cover “Clay Pigeons.” That sparked an interest for research and eventually a door to Foley’s tumultuous life was opened. As luck would have it, Hawke’s friend Louis Black knew both Blaze and Townes Van Zandt (an important figure in this tragic country blues singer’s life). Black is the one who told him to read Sybil Rosen‘s (Foley’s ex-wife and muse) memoir Living in the Woods in a Tree: Remembering Blaze Foley for more personal insight and rather than simply adapt it himself, Hawke enlisted her to come onboard. It’s no wonder then that the film was made on a shoestring budget since this sort of fated progression paired with a true desire to honor the subject naturally isn’t quite the Hollywood way. That doesn’t, however, mean the finished product feels any less accomplished. This is a gorgeous piece of art with a soft photographic vignette aesthetic, a wonderful soundtrack that’s as much a testament to Foley as the musician/actors performing for the camera, and an emotional potency built through an expertly interwoven non-linear narrative structure. We’re watching the final day of Blaze’s life play out (mostly in order) against the past (his romance with Sybil) and future (a posthumous interview with Van Zandt and harmonica player Zee). Truth, lies, legend, and revelry merge together as one. So who was Blaze Foley (Ben Dickey)? We see him and his ZZ Top beard alongside Zee (Josh Hamilton) and Van Zandt (Charlie Sexton): drunk, belligerent, and always ready to belt out a song with the necessary sorrow to let it penetrate our heart. We see him with shorter facial hair and a genuine smile as he and Sybil (Alia Shawkat) reside within a cabin on a Georgia commune run by the ever-affable Glyn (Wyatt Russell). And we hear about him via a sterile recording studio from the mouth of Van Zandt and eyes of Zee: the former spinning mythological yarns full of platitudes, magic, and genius while the latter’s looks and reactions increase with skepticism and shock to the point where we can’t believe a single word. Add them up and you can begin to understand who this man was with his combination of gentleness and love alongside the pitch-black demons of his soul. We’re transported from multiple barroom brawls to a happy Blaze and Sybil riding in the back of a pick-up truck before the first fist can be thrown. Each of these cuts becomes an astute means of simultaneously propelling us forward through three sequential timelines against the backdrop of his songs as sung at the Austin Outhouse during a live recording session complete with clinking glasses and rowdy patrons. Hawke utilizes the music as the script’s backbone, lyrics augmented by an aural and visual account of the memories they conjure within Blaze as though his mind knew he wouldn’t survive the night. And there’s always more than meets the eye with visits to Sybil’s parents (Mom played by the real-life Rosen) and Blaze’s father (a heart-rending Kris Kristofferson with but five words to his performance) allowing for subtle yet telling insight into their psychological states. Tragedy strikes, distance is battled, and alcohol is consumed with most sequences ending in one of two ways: silence or contrition. The one thing we never get, however, is some overly dramatic blow-up meant to force us into thinking one way or the other about blame or guilt. Instead Hawke lets the devotion that’s simply too big to survive end in mutual tears. He lets the affection Sybil and Zee have for Foley well up until we can understand its weight without being explicitly told. That care and grace is seen throughout and something I have to believe is a byproduct of Rosen’s involvement. To have someone who felt that love ensure it’s expressed with meaning rather than melodrama is huge when it comes to biopics. I’m generally bored by this genre, so that level of intimacy coupled with Hawke’s unconventional formal structure really allows Blaze to become a bona fide experience rather than merely a history lesson. No one is going through the motions here and so much is ultimately said without words in a way that’s purely cinematic and the exact reason why something so personal deserves to be transferred to the screen whether or not it already has a worthwhile literary counterpart to read. Emotions crest early and never dissipate. We feel every powerful release of frustration and every rare display of hope thanks to a stunning portrayal by Dickey. This is his first credited acting role, his involvement yet another product of kismet on behalf of Hawke and who he knows. The writer/director says this adventure was always one he hoped to take with Dickey by his side and the Arkansas-raised vocalist (with Shake Ray Turbine, Blood Feathers, and solo work) does not disappoint insofar as being able to embody the volatility of this lifestyle and the darkness that could rise from within. It’s an awards-worthy performance with nuance and honesty that refuses to fall into caricature despite there being many drunken instances where it could have easily done exactly that. He does his troubled subject proud. The same goes for Shawkat as she proves the beating heart of the whole, those memories of the past allowing her presence to be felt even when her part of his story was over. She, Hamilton, and Sexton are wonderful with the rest of the cast following close behind. The only time I felt less than one hundred percent committed to the atmosphere and sense of place Hawke cultivates is when Steve Zahn, Sam Rockwell, and Richard Linklater (yes, the director) arrive as Zephyr Records execs. In a film where everyone is absorbed by his/her role, these three can’t help but let their celebrity take over in a small, intentionally comedic plot thread. Besides that, though, Blaze excels right to its brilliantly tongue-in-cheek record scratch of an ending.